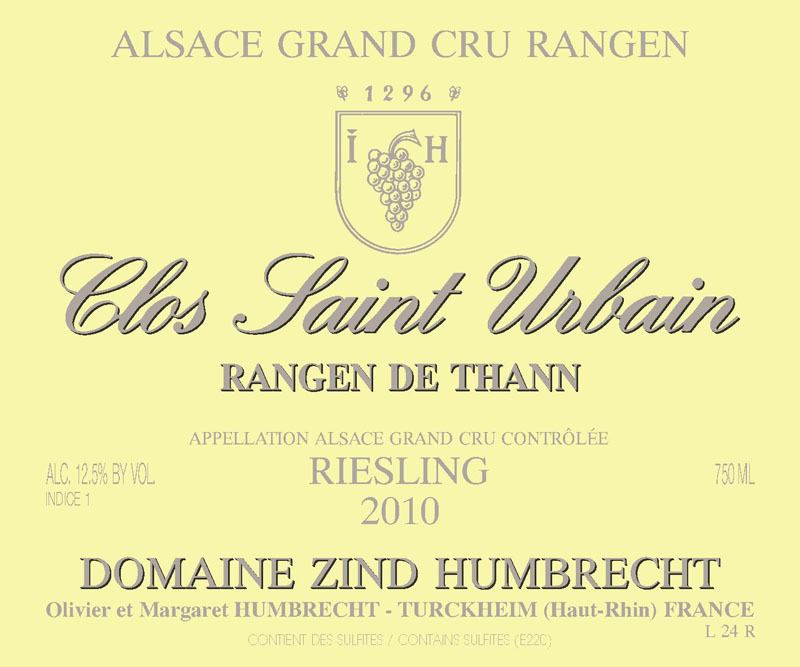 The Clos-Saint-Urbain is located around the Chapel Saint-Urbain in the middle of the Rangen Grand Cru vineyard in the village of Thann. The Rangen vineyard is our highest vineyard (350m to 450m) and probably one of Alsace’s highest as well. Despite the incredible warming effect of the dark rocky volcanic sedimentary soil and the steep south facing 90% slope, bud-break and flowering is usually about 2 weeks later than in Turckheim. In 2010, this allowed the vines to flower under better weather conditions and in fact we harvested almost a normal crop size in Thann, unlike all our other vineyards. The yields are very low, but this is almost the norm in this vineyard. Some of the younger vines were declassified in our Thann Riesling and all grapes were harvested very healthy in 2010. The fermentation was actually one of the fastest. This vineyard often enjoys a totally different climate than the rest of the estate and 2010 is quite a late ripening style vintage. 3/2012: it is so easy to recognise the vineyard by just smelling the wine. There are strong flinty and earthy aromas on the nose that can almost be mistaken for reduction. Tasting all three grapes from Rangen is very revealing in 2010 as all three show similar aromas. The palate is powerful, despite a lower alcohol, long and finishes with a nice velvety texture. The wine shines more by its vineyard character than high acidity. In this case, the acidity is much salinized and it brings a new dimension of texture on the palate. This is definitely meant for long keeping!